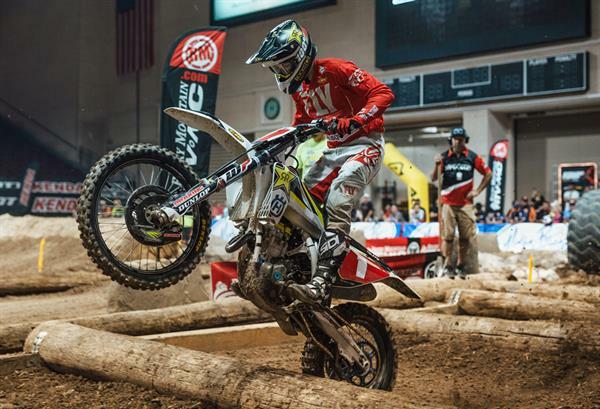 HomeNewsRockstar Energy Husqvarna Factory Racing’S Colton Haaker Wins At Las Vegas Endurocross! August 21, 2017 Michael Le Pard News Comments Off on Rockstar Energy Husqvarna Factory Racing’S Colton Haaker Wins At Las Vegas Endurocross! The Orleans Arena in Las Vegas, NV marked the start of the 7 round EnduroCross Series for 2017 and with it, an all new format greeted defending champ, Rockstar Energy Husqvarna Factory Racing’s Colton Haaker. Fans now get to witness the skills of the top seeded ‘Super EnduroCross’ riders a minimum of three times on the night including the all new and very exciting ‘Bracket Race’ segment. Colton Haaker wasted no time, coming into the opener fit and ready, and left holding onto his red #1 plate after scoring max points over the nights racing. Colton Haaker pulled the holeshot in the Super EnduroCross Qualifier and looked strong. Cody Webb was putting pressure on him and made a pass on the second lap before Haaker made a pass stick shortly after, right before the water hole to retake the lead. He held strong to claim the win and move on to the main event. Haaker won his first bracket race, took an easy win in his second bracket race, and had an exciting win in the final bracket race to take the extra championship point. Haaker was second at the start of the Super EnduroCross Main and was on the move. He inched closer to leader Cody Webb lap after lap and made the pass for lead while Webb took the no-joke lane in the eighth lap, but went back to second the following lap after a mistake. He came back with a vengeance and made the pass for the lead again on the ninth lap and pulled away claiming the first Super EnduroCross victory of the season. The next EnduroCross event takes place on September 23 in Reno, Nevada.